Now the rest is simple! Cut a strip of scrapbook paper, about 3-4 inches tall. Feel free to use decorative scissors to make a funky edge! 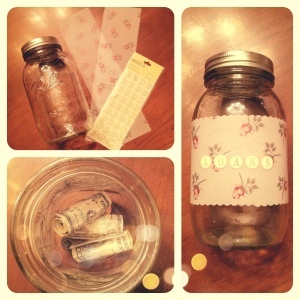 Place your message using your stickers BEFORE applying it to the jar. This way, the stickers won’t come out crooked. Add cute details like ribbons, rhinestones, and studs! This is a the fun part, so go all out! Next, simply wrap the strip around the jar and secure it with tape. Finally, remove the inner top of the mason jar, leaving it open. Now, place it in an area you walk by everyday, and every time you find spare change or have a couple extra dollars, drop it into the jar! Try saving a specific amount from each weekly paycheck and promise yourself that whatever amount is in that jar, it CANNOT be touched. What’s great about this simple and affordable DIY, is that you don’t have to use it for just loans. Need motivation for weight loss? Label the jar “new wardrobe” for when you reach your goal! Want to splurge on new fall boots? Tape a picture of them onto the jar! It seems silly, but seeing something that will remind you to save daily will truly help in the long run. And remember, every penny counts!